Six rising 7-12 graders from Macon and Montgomery counties in Alabama attended a week-long GIS/GPS summer camp at Tuskegee University Extension computer lab, Tuskegee, AL from July 9 - 14, 2012. Students were introduced to the basics of navigation using the ABC’s of compass to help them understand navigation instruments. Using the Arc GIS online software they mapped out farmers markets located in the 18 counties that represent Alabama Black Belt region. Their map can be found here. 4-Hers used ESRI GIS online to create Arizona Dream Vacations. The youth then participated in GIS Day with Maricopa County. GIS day was a lot of fun and the youth got to share and learn more from other GIS professionals. Jacob Wright, Collin Wright, Paige Hill, Bailey Hill, Arman Ghazi, Ross Lively and Emma Drews each completed their own projects. Students from Eureka Springs High School created an emergency evacuation landing zone project that identified rural roads for 911 emergency calls. Other projects included mapping emergency evacuation landing zones and the Historic district. Students from Springdale middle school used GIS to map potential locations for installing Little Free Libraries in their community. As a result, the University of Arkansas' Volunteer Action Center launched Razorbacks Read to collect books for students and to fill Little Free Libraries throughout northwest Arkansas. Nettleton Middle School students in Jonesboro are collecting data on their bus routes in the hope of increasing efficiency. They are looking for things such as the location of each stop, turns taken, and traffic conditions along the route. The project is expected to be completed by spring break 2018. The National 4-H GIS Leadership team collected location data for sea lavender at the Tijuana Slough National Wildlife Refuge. The US Fish and Wildlife Service (USFWS) plans to use the data to manage the problem and eradicate the invasive plants. After firefighters were unable to locate a hydrant near a barn fire in his community, 4-H'er Austin decided to create a map of all the fire hydrant in the Sioux Falls Fire Department district. Geographic Information Systems (GIS) students at Hoover High are working with real-life clients to map the most used routes by students to walk and bike to school compared with those that get the most car traffic. Their findings will be used by KTU+A, a firm seeking to improve the corridors in City Heights in terms of storm water treatment and increasing bicycle and pedestrian activity in City Heights. Jacob Gray put together a story map using pictures and points GPS'd by other 4Hers, with text from the local historical society. 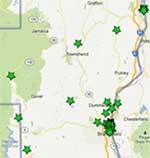 In El Dorado County, the Youth Commission created GIS maps of the county that helped youth take social action. In the timber-producing county of Shasta, 4-Hers used GPS & GIS to map data from 1900 to 2008 for fire perimeter charts and fuel break locations. Sixth grade 4-Hers mapped all the public property trees in the town of Hayden. 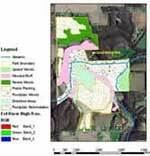 This project mapped many aging cottonwoods - helping the town budget for and schedule pruning and removal. The project helped the town become designated Tree City USA, allowing for successful grant applications. Youth in Windham County teamed up with NEN to create Wind Tunnel - a community mapping project to connect youth with opportunities in their community. There are three categories: Free Food, Career-Related Opportunities, Community Service Opportunities. Students from Maui High School, HI use GIS to identify various local issues including locating invasive species, community safety, and shark attacks. See their video here. Sisters from Molokai High School, HI, studied Red Mangrove and its impact on Molokai reef. 4-H club members who are members of the Mayor's Youth Advisory Council in Decatur, IL collected information on “green” resources in their community. The project was one of the first steps in the Sustainable Decatur Initiative. These high school students partnered with the city’s environmental planner and collected data on the location and type of “green” resources, ranging from parks to trash collectors to recycling centers. See their project here. 4-H club members in Monroe County, Illinois build partnerships to map and raise awareness of diverse community resources. Projects include restaurant map, park trails for local nature preserve, and a tree inventory. In Hendricks County, teens applied GIS skills to help understand wind energy potential, to show the spatial distribution of 4-H cattle and swine locations throughout the county; and to study the severe weather reports/patterns from 1950 through 2006 (hail, tornado and wind damage). The Harrison County 4-H IT Adventures received 1st Place in the "IT Olympics" for their Community Service Project, "School 'A Where' Ness Project, Saving Time to Save Lives." The project included an interior map of the West Harrison and Logan Magnolia School Buildings. The youth created the classroom, hallway, offices, and special use spaces on a digital map. They then added room numbers, doors with arcs to show which way they open, fire alarm pull and alarm locations, security camera locations, chemical storage areas, utility shutoff locations and storm shelter locations. Members of a 4-H Tech Team in Mahaska County Iowa, mapped a local cemetary and learned a few important lessons along the way.